On Twitter, Zunger has conceded many of the below points and admitted that he would add caveats had he known his article was going to be read by as wide a group. As he does not wish to add these caveats now, I am posting this commentary as a corrective to what I see as unhelpful paranoia. Tom Peplinsky’s rebuttal is also well-worth reading. On Twitter, Zunger’s response has been an appeal to Pascal’s Wager: that the danger of being wrong about a coup is too high to ignore his nightmare scenario. I consider this to be a specious argument capable of justifying nonstop fear and loss of perspective. The theme of this morning’s news updates from Washington is additional clarity emerging, rather than meaningful changes in the field. But this clarity is enough to give us a sense of what we just saw happen, and why it happened the way it did. Beware of any claims of clarity. The fog of war is immense now. 90% of what is going on is happening behind closed doors. Giuliani does not speak for the administration, nor did he have anything to do with the drafting of the order. He is not reliable and certainly has reason to want revenge on Trump, who humiliated him by not giving him Secretary of State after Giuliani said he was a shoo-in, and leaked that Giuliani lacked the “stamina” for the job. The Trump administration does not seem fond at all of Muslims, but the practical effects of the EO remain a mystery even now. The order was drafted incompetently, so that it was unclear whether Green Card holders were or were not included. Bannon and Miller were indeed the motivating forces behind it, but they do not represent the entire White House. It seems more likely that the remaining WH has been trying to clean up their mess. The Guardian piece paints a very confusing picture. Clearly the administration chose to get rid of these people, but it is not clear at all the implications of the act nor the underlying motivation. 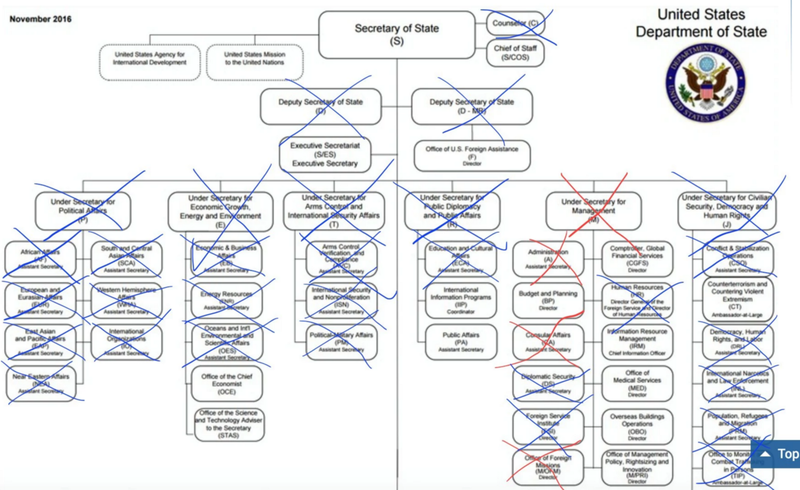 The seniormost staff of the Department of State. Blue X’s are unfilled positions; red X’s are positions which were purged. Note that the “filled” positions are not actually confirmed yet. “Likely not accidental” is pure supposition. A lot of what’s going on at the moment is accidental, given the ham-fistedness and ignorance of the Bannon/Miller faction. Bannon, Flynn, Kushner, and Priebus do not form a unified faction. Reports are that Flynn has been sidelined already. Priebus and Bannon seem to disagree on nearly everything, while Kushner has kept very quiet as Trump’s consigliere. One should never attribute motivations to them as a whole. This doesn’t have much to do with a coup. This is very, very speculative. The Steele Dossier has not been verified in any way, shape, or form. The coincidence of the two percentages may be just that. Yes, a sanctions quid pro quo is definitely a possibility, and worth thinking about. It still does not relate to a coup. This is pure supposition. It’s not even clear that green card holders were originally intended to be part of the EO, given the ambiguity of the language in the incompetently draft. Bannon and Miller decided it was hours after its release, after DHS officials had said it didn’t apply to Green Card holders. They appear to have pushed for it to continue holding. Regardless, there is no way to assign a singular “goal” to the administration, since the weekend’s events were borne more of chaos than strategy. Bannon’s faction does seem to want to cause chaos, but there is no evidence of what particular form of chaos they wanted. It seems unlikely that what resulted matched their plan unless they are genius masterminds. As for “resistance fatigue,” this sets up a no-win scenario. If you protest, you lose. If you don’t protest, you lose. This is defeatist logic. It’s also tautological. Given that the Trump administration is going to do shocking transgressive things, “resistance fatigue” is guaranteed! You don’t have to have it as a goal. The provisions exist outside of the executive branch. Of course they are not going to cede power explicitly in their own words. But this too does not indicate a coup, it’s simply keeping their options open. This is the most dangerous exaggeration. Steve Vladeck’s expert analysis suggests we should be highly skeptical of any organized, top-down order for defiance of injunctions. The incidents we are hearing about seem incidental, disorganized, and uncoordinated, far more likely to be the result of inertia or CBP aggression than of some orders from the WH. Sure, it’s possible Bannon called up CBP and said, “Hey, don’t release a few of those guys just yet, I want to see what happens,” but there is no evidence whatsoever for that. And the DHS statement has nothing to do with the injunctions, but simply is a statement of process. Of course they’re going to follow the orders. There was no injunction against them as an entirety. This does not follow. There’s no guarantee that whatever happened in this case would follow in some other case, and in any event, this made a very poor test of disobedience given the overall chaos. If there were to be a test, the orders would have been far more specific in the first place. Why would Priebus pull back on Sunday if they wanted the DHS to overreach as much as possible. This is an astonishingly alarmist and irresponsible statement to make. It is unjustified supposition and should be labeled as such. A second major theme is watching the set of people involved. There appears to be a very tight “inner circle,” containing at least Trump, Bannon, Miller, Priebus, Kushner, and possibly Flynn, which is making all of the decisions. This is not a tight inner circle. 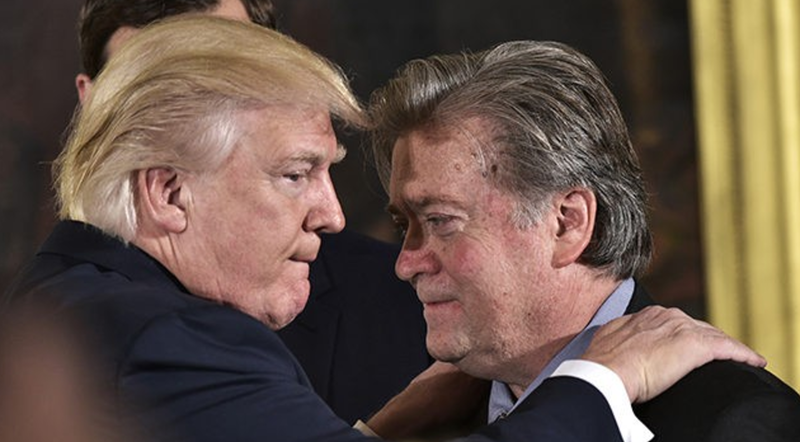 Bannon and Miller are aligned, but Priebus is in league with the Republican establishment, Flynn is sidelined, Trump is trying to play them all off one another, and Kushner is a mystery. They are anything but unified. Other departments and appointees have been deliberately hobbled, with key orders announced to them only after the fact, staff gutted, and so on. Yesterday’s reorganization of the National Security Council mirrors this: Bannon and Priebus now have permanent seats on the Principals’ Committee; the Director of National Intelligence and the Chairman of the Joint Chiefs of Staff have both been demoted to only attending meetings where they are told that their expertise is relevant; the Secretary of Energy and the US representative to the UN were kicked off the committee altogether (in defiance of the authorizing statute, incidentally). I believe this is accurate, but none of this supports a coup. It seems more likely to lead to executive dysfunction than to power consolidation. Not clear at all that the DHS and FBI have remained loyal to the president, just because they haven’t shown open dissent as the CIA has. A senior DHS official said “No one has any idea what is going on” Friday night. They do not sound like a unified bloc. The “shadow government” is pure hyperbole which makes it sound like we’re turning into Russia. Just like they did under Obama. Yes, I have no doubt Trump is trying to enrich himself through the presidency. This isn’t a coup. It’s just looting the country. He said many contradictory things during his campaign. “Actively probing” is an overstatement. They are trying to consolidate power, but do not appear to be doing so in a particularly organized manner. It seems more likely to result in breakdown of executive power than consolidation. As I have said, it looks more like an autocracy at the end of its existence than the beginning. Neither of these goals require a coup. Again, this underscores the doom-and-gloom nature of this post and undermines its claim to be grounded analysis. It should not be taken as any sort of prediction, but as a worst-case scenario spun out from cherry-picked anecdotes, conspiratorial interpretations of ambiguous events, and a general neglect of Occam’s and Hanlon’s Razors.